Andre Johnson and Larry Fitzgerald are great WRs, don't get me wrong. (As for Michael Crabtree--he hasn't even been drafted yet. Given the high rate of WR busts, no one knows how he'll turn out.) But Calvin Johnson is better. Calvin Johnson is taller and faster. (6'5 vs 6'3 and 4.35ish vs about 4.45ish) He also has about 15 pounds on both of them. Fitzgerald and A. Johnson both seem to have good demeanor's, but Calvin is extremely humble. He's played with five different QBs in one season. That is an NFL record. He's putting up top five WR numbers on a winless team with no offensive line and (since Martz's departure and Furrey's injury) no real true complimentary threat. And if you were uninformed, you may just think that is due to the high number of balls hes been thrown. But you'd be wrong. He averages about a measly three catches a game. Do you not see how impressive that is? Barring a major injury, if the Lions ever got their act together, he's probably HoF bound. Yes, he is a once in a decade player. I fully believe that. As for AP--some people thought he'd turn out good, but no one thought he'd be as great as he has been. Another funny thing about that, the Vikings took him, when at the time RB was about the last thing they needed. I guess you should always draft on need right? And yes, Calvin Johnson was a need. BMW was a total bust. They failed to sign Kevin Curtis. They did sign McDonald but no one thought he'd be as good as he turned out to be in the Martz offense. He was like a 4th/5th stringer in St. Louis, no one really even knew who he was. Martz said it himself: with only two WRs he could only use half his playbook. He needed four. RB wasn't really considered to be that great of a need at the time. KJ was injured but their was hope he'd make it back. And they were still high on Martz's pet project Brian Calhoun. I liked the CJ pick then and I still like it now. I agree, The Johnson pick was a good one. He has been nothing short of amazing, if we didn't take him we'd have no way of scoring any TD's this year. The effort he gives on an 0-14 team is amazing. The hyperbole is in full effect. Henson and Stanton have only taken token snaps this season. Andre and Fitzgerald both made Pro Bowl berths in their 2nd seasons with equally depressing offensive lines and inconsistent QB play. The point is, how could Calvin be a once a decade type player when those guys were just as dominant in college, and to say Calvin is better WRs than them both, would really be ridiculous. Calvin is still growing as a player to get to their level. Should he get there? Yes. Is he yet? No. Hall of Fame? I'll assume you are kidding with that statement as well. As far as the Vikings, Chester Taylor was/is a middle of the road RB. In a league where 2 good RBs became a necessity, they took a player that could fill that need. The Vikings, unlike the Lions, were set at most important positions when making the draft choice. They could have went Patrick Willis, but they felt the need to get an offensive playmaker with the pick since they were set at O line and didnt have one. No one thought AP would be as good as he has? Did you watch college football from 04-06? He was more ready to dominate at the pro level than any other player in college. More than Calvin. He only dropped due to unfounded injury concerns. If WR was a need in 2007, I guess WR is a need again this year since Roy got shipped out. Should we be scouting Michael Crabtree and Dez Bryant? First, you're wrong. Stanton played an entire quarter. Second, even if we're down to four (one of which being Culpepper who joined the team in like week 8 or 9) you don't think that's impressive? Are you kidding me? Andre and Fitzgerald both made Pro Bowl berths in their 2nd seasons with equally depressing offensive lines and inconsistent QB play. The point is, how could Calvin be a once a decade type player when those guys were just as dominant in college, and to say Calvin is better WRs than them both, would really be ridiculous. He already has better stats than A. Johnson through 2 less games. His stats are almost as good as Larry Fitzgerald--except Fitzgerald had almost twice as many catches. And yes, the 2005 and 2004 Cardinals and Texans teams were bad. But this year's Lions are oh so much worse. Both of those teams would slaughter these Lions. Calvin Johnson is in a much worse situation than those other two WRs were back then. Here are Fitzgerald's and A. Johnson's stats for this season. Compare them with Calvin's above. Calvin is in their ballpark. He's almost as good, except the Texans are a mediocre team and the Cardinals are playoff bound and perhaps NFC title contenders. The 2008 Lions are the worst team in the history of the NFL. Hall of Fame? I'll assume you are kidding with that statement as well. As far as the Vikings, Chester Taylor was/is a middle of the road RB. In a league where 2 good RBs became a necessity, they took a player that could fill that need. The Vikings, unlike the Lions, were set at most important positions when making the draft choice. The Vikings had HUGE GAPING HOLES at WR and CB. They had the unproven (turned out to be bust) Tavaris Jackson at QB. They were picking at 7 for a reason. They weren't a very good team and they had holes. The lone strength of their team in the 2006 season was the ability to run the football. To say that RB was a major need for them is total revisionist history. No one thought AP would be as good as he has? Did you watch college football from 04-06? He was more ready to dominate at the pro level than any other player in college. More than Calvin. He only dropped due to unfounded injury concerns. Six teams passed on him. Hindsight is 20/20, but those "unfounded" injury concerns where there at the time. Type in "2007 NFL mock draft" in google and click some results. Few mock drafts had him going in the top 5. If WR was a need in 2007, I guess WR is a need again this year since Roy got shipped out. Should we be scouting Michael Crabtree and Dez Bryant? I DO consider WR to be a need this year, but not as big of need as back in 2007 since we won't be running Martz's spread offense. Even then, Oher/Smith and Stafford/Bradford all seem to be better prospects than Crabtree and Bryant. I'm in favor of picking the best prospect. Dez Bryant is just a sophmore, he cannot declare until next year. Vikings did not have a huge gaping hole at CB. Fred Smoot was replaced with a rookie Cedric Griffin the season before and Griffin filled in fine. Winfield always was solid on the other side as well. WR, you get no argument from me, Vikings had much more of a WR need than the Lions only they were smart enough to know that you can find a good young WR in free agency far before you can a RB. Roy already proved to be a good #1 WR in Martz offense, Furrey was a suitable #2 WR with 98 catches, McDonald proved to be a suitable #3 in the past in Stl. WR could have used another body, of course, but needed it so bad to sacrifice the any of the players we could have had at #2? At the time of the draft, the Lions had Kevin Jones with a serious foot injury, Arlen Harris and Aveion Cason at RB. It made zero sense not to take Adrian Peterson. The only other option was taking a chance on Joe Thomas' knee. Adrian Peterson was the guy in the draft with the best college career, a complete RB and filled a dire need for the Lions. Similarly, in 2009, the Lions have a 32 year old, breaking down Jeff Backus at LT who cant handle the position for 16 games any longer. That is a dire need at this point. There is the top of the line talent at LT in Oher who played a huge part in Jevan Snead's resurrection at Ole Miss. It only makes sense. Dan Orlovsky has an 88 QB rating in his starts and is 25. Your personnel always factor a role in your drafts. If not, you are Matt Millen drafting in a vacuum. Vikings did not have a huge gaping hole at CB. Fred Smoot was replaced with a rookie Cedric Griffin the season before and Griffin filled in fine. Winfield always was solid on the other side as well. WR, you get no argument from me, Vikings had much more of a WR need than the Lions only they were smart enough to know that you can find a good young WR in free agency far before you can a RB. Let's forget individual players and just look at overall team stats for a second. The Vikings in 2006 had the 16th ranked rushing offense. They had the #1 ranked rushing defense. They had 18th ranked passing offense. They had worst passing defense in the league (tied with Cincy for 31rst). Maybe you're right and it wasn't the CBs. I don't know. But they weren't a very good team in 2006 primarily because other teams just threw the football all over the place against them. They also (and still do) had one of the best offensive lines. They didn't need a RB. Running back is one of the easiest transitions into the NFL. Look at green bay with the undrafted Ryan Grant. Look at the Giants with their trio of low picked running backs. Look at Marion Barber in Dallas (third rounder). Frank Gore (also third rounder). All the backs in Denver that have had success. All the second and third round rookie running backs that are lighting it up this year. The Vikings could've drafted someone in the fifth round and plugged him into their line and their rushing offense would've been fine. Don't get me wrong, of course, I think the pick was a good one by the Vikings. You're the one being hypocritical. RB was just as much of a need for the Vikings as WR was the for Lions in 2007. You can hate on the Lions for drafting ability over need in 2007, but don't praise the Vikings for doing the same damn thing. Lets not look at overall team stats, as they lie. Vikings, the past few years, have had legendary rush defenses. In 2006, teams threw on the Vikings more than any other team in the NFL as they sought to avoid the Williams Wall. While they gave up the most yards per game, they were 14th in the league in opposing completion %. They were also 5th in the league in ints and got more ints than tds given up. Corner was not a dire need. Lions had a Pro Bowl WR, a Pro Bowl alternate WR was about to get a decent 3rd WR. Vikings didnt have that at RB before Peterson. If the Lions drafted say Joe Thomas last year and kept Roy, we would be considerably better off, and maybe even in shape to take a QB this year. Today, no. This year’s LB class is very strong inside and outside and could be the gem of the draft, with intriguing versatility a signature of the group. With the addition of defensive ends being projected to rush linebacker, this year’s class really could turn out to be not only deep, but special — maybe even unmatched in its overall strength. A thickly built, strong, physical, hard-hitting ’backer with the size, instincts and overall athletic ability to line up at any position in a 3-4 or a 4-3 front. Curry’s value in large part stems from his versatility, as few linebackers possess the skill set to be effective at any position in either system. Might not have the overall length desired in a rush linebacker but has been extremely productive playing over the tight end, and his strength at the point of attack and ability to shed blockers is rare. With knuckle-breaking hand strength, he ragdolls blockers and plays a big man’s game with power. The most complete ’backer to come out in a long time, Curry has few deficiencies in his game and easily could fit into the top five. Scouts love his physical skill set. Despite playing over the tight end, Cushing kicked inside to replace an injured Rey Maualuga early this season and has the size, strength and striking ability to project inside in the NFL for a 3-4 or a 4-3 defense. Injuries have slowed Cushing throughout his career, and his overall injury history will be scrutinized closely and detract from his value, but he has played in every game in ’08 despite breaking a bone in his hand and wearing a cast. He is very competitive and driven and has played best in big games against better competition. He is tightly wound and somewhat stiff in the hips, but his all-out demeanor and overall intensity should allow him to contribute right away in the pros and push him into the first round. Playing the same position at which Shawne Merriman excelled at Maryland, Sintim has been a force coming off the edge and has the experience rushing the passer to transition easily to the highly desired rush LB spot in a 3-4 front. Leading the nation in sacks from the LB position, Sintim has shown he can stick his hand in the dirt or drop into coverage. Having shed weight and shown better hand use and burst off the edge this season, he plays physically and also could be effective playing inside. However, he’ll warrant the most interest for his pass-rush ability and should fit into the first round. A miniature version of former NFL LB Bill Romanowski, Herzlich is expected to remain in school and could benefit from another year of seasoning. Somewhat mechanical and robotic in his movement, yet athletic enough to make plays to the sideline, “Little Romo” plays smart, with good technique and hand use and gets the most out of his ability. Somewhat similar to Patriots LB Mike Vrabel with the length and power desired to rush the passer, Herzlich could project outside in a 3-4 front. Leading the team in tackles from the SLB position, Herzlich’s motor, intensity and playing demeanor project well to the pro game. Having stood out and made more plays than more highly publicized teammate Darry Beckwith, Riley consistently cleans up ballcarriers from the weak side and has the potential to be the best ’backer to come out of LSU in the past 10 years. Tough, physical and instinctive, he shows very good range to the sideline and has the explosive movement skills to make plays all over the field and drive through contact. Does not have great size and can be engulfed if blockers get their hands on him, but when he is free to roam, he hits like a missile. Perhaps a victim of very lofty expectations, Laurinaitis has disappointed evaluators who were hoping to see a bullet like Dan Morgan who was going to knock the heads off ballcarriers. Scouts have downgraded Laurinaitis for his lack of explosiveness and physicality. He’s not a nasty, downhill, blow-up tackler but is very instinctive with a great nose for the ball, makes plays sideline to sideline and has a great feel for coverage. He has the versatility to play every LB position and might be best suited playing on the weak side where he is covered up and free to roam, in the same mold as former Butkus Award winner Paul Posluszny, whom scouts also accused of peaking earlier in his career. However, despite not being a violent assassin, Laurinaitis’ character is exceptional and he might have the highest floor of any first-round talent because NFL clubs can know exactly what they are getting. Still should fit into the top 15. A true “Mike” linebacker with terrific strength at the point of attack, Maualuga still gets out of position too often and takes some questionable angles. When he has a clean window, he can strike with the authority of a small truck and level ballcarriers. However, he is tight in the hips, does not change direction cleanly and could be restricted on third downs, limiting his overall value. Durability and overall character still need closer examination, and perhaps the biggest question scouts will want answered is whether he can be more than a two-down, “Mike” ’backer in the NFL. A strong tackler with good overall instincts, Maualuga should contribute readily in the pros if he can stay focused. In a similar mold as former Gator and Miami Dolphins 2005 third-rounder Channing Crowder, Spikes is instinctive, has a knack for the ball and fits the mold of an old-school “Mike” linebacker. Very leggy and somewhat bow-legged, he is not a great natural athlete, has a tendency to let his pads rise and too easily can be cut. However, he is limber with great stride length and overall range, and when he plays with bent knees he can knock ballcarriers backward. Has a reputation for running his mouth and plays the game with a lot of vinegar and intensity, setting the tone for the defense. Brings emotional, on-field leadership qualities highly desired by many coaches and initially was expected to declare early for the draft. However, he lacks great speed and could benefit from another year of training at Florida. Might work out and test as well as any linebacker in the draft, possessing exceptional speed and power. However, as much as the weight room might be his domain, he has not been able to transfer his workout numbers consistently to the field and his performance as a senior has slipped. Is naturally explosive and plays with good knee bend but has been too tentative and does not consistently uncoil. Having missed 3½ games with injury, he has gained some weight and not appeared quite as quick as he did chasing down ballcarriers a year ago. However, he still can run like the wind and might warrant even more interest on the weak side. Has run into problems off the field, and his character could affect his draft value. Scouts would like to see Beckwith play more physically. He lacks great size and take-on strength and too often has struggled locating the ball as a senior, not showing the natural instincts to consistently produce. He gets good depth in coverage and has good movement skills, but too much of his game is based on finesse and he needs to become a more forceful tackler to play inside in the pros. Having missed time in September following a knee scope, he has not played at full health, but the injury does not justify him being out of position as much as he has this season. Got this from pro-football weekly, thougt it might be of interest, enjoy! CJ was a bad pick given the circumstances. no matter if he goes to the HOF. How many games have the Lions won with CJ on the squad? It looks like they'll go winless with him playing very well. WR only have so much impact. That's why you don't do what the Lions did last year. I said it then and I say it now. Look at what has happened since. Hows this all working out? Are you saying the Lions are about to go win less because they drafted Calvin Johnson? I'd love to see how much worse the Lions would be without Calvin. They'd be setting all kinds of records, for least TD's in a single season. Andre Johnson had questionable hands and route running skills coming out of college, but his physical talent (size, speed) was great and that's why he went as high as he did. I actually preferred him over CRog, but that's water under the bridge now. Fitzgerald was seen as having the technical skills (route running, vision, hands) and the x size, but his speed was questioned. With CJ you had everything. He had never-before-seen size with speed, as well as the discipline of route running and focus to catch the ball. That is why he WAS considered a once in a decade receiver. All that being said, I was not in favor of the pick at the time, though I'm glad that they did take him now. I much prefer CJ over Roy. Furrey was NOT a second receiver, he just flourished because of the scheme. McDonald is the same thing, not a true second receiver. Both are better suited to be slot receivers. Still, the Lions could have gotten their second receiver later in that draft. 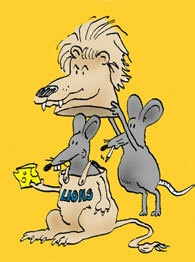 Shoulda, woulda, coulda.............that should be the mission statement of the Lions during the Millen regime. I can't tell you how many players would be different on this roster if I were in charge. We would have gotten Shawne Merriman AND Justin Tuck.....in the same draft. It's a money issue when it comes to the draft. Unless they fix this with the next barging agreement those high pick just cost to much money. So if your picking in the top 5 you need to target money positions (QB, WR, RB, LT, DL and maybe CB). If you take a S, OG, TE, etc. your over paying for the position. It's simple cap economics.